With the rise of online reviews, customers are connected like never before. They promote. They criticize. review monitoring is an integral and constant part of customer acquisition. Our online review monitoring tool displays all your customer feedback from 150+ sites, and sends you SMS or email alerts every time a review is posted for your business. Filter these alerts by source and star rating so you’re only notified about reviews you find most critical. Manage your team efficiently with role-based dashboards and custom alert settings at the corporate, regional and branch level. Choose to be notified the moment a new review is posted, or to view a comprehensive daily digest. Customize alerts based on review rating, review source, or keywords. Closely monitor what's most important to you and filter out what's not. 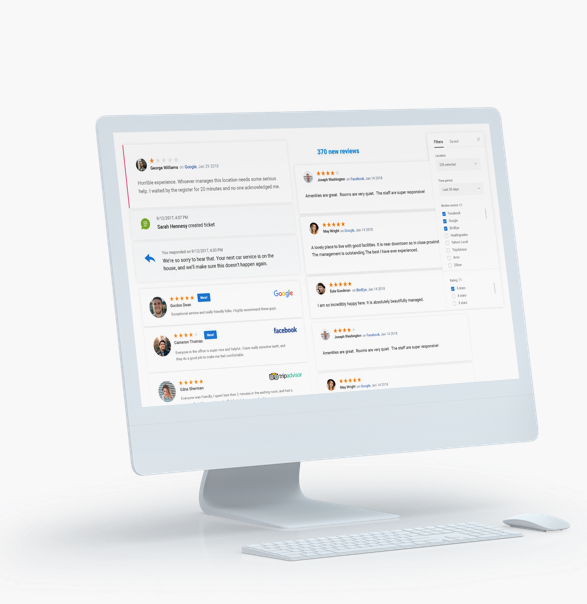 Easily organize your reviews with custom online review monitoring hierarchies and filters for specific regions, locations, products, ratings, sources, and employees so you can quickly access the exact customer conversations you need.